Infinio delivers a software-based server-side cache that provides high performance to any storage system in a VMware environment. It increases IOPS and decreases latency by caching the hottest data on RAM and flash devices. Last year we talked with them about the launch of their latest product. 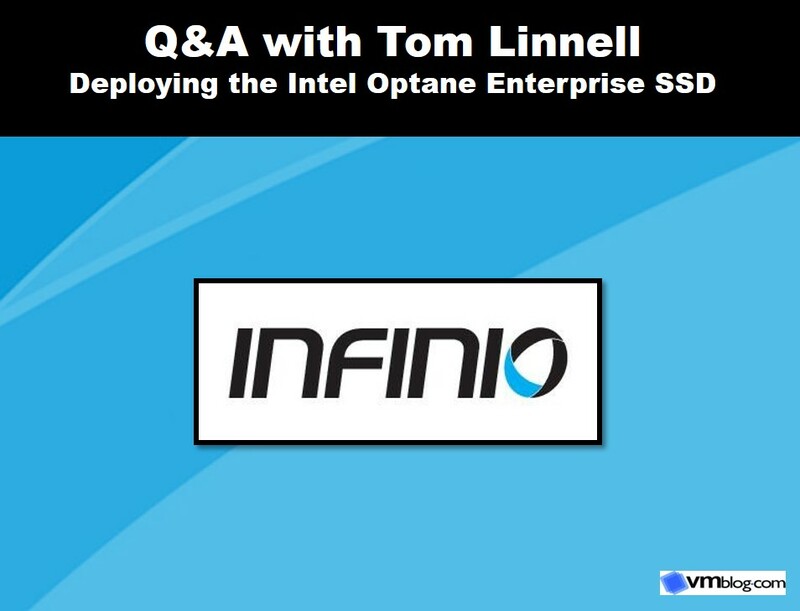 Today we are talking to Infinio's VP of Engineering, Tom Linnell, about Intel's new Optane enterprise SSDs. VMblog: There's been a lot of talk about Intel's Optane technology since its release in April, but it seems like IT leaders are still trying to figure out the best way to deploy it. First off, what is Optane? Tom Linnell: Intel's Optane SSD is an enterprise-class device based on their newest memory technology, 3DXpoint. It's faster than flash and less expensive than RAM. VMblog: Where are those characteristics best deployed? Linnell: Well I work at a caching company, so I bet you can guess what we think - but seriously, there are several good reasons for Optane to be used for server-side caching. VMblog: And why is that? Linnell: The first answer is purely one of latency. The specs indicate that these cards have response time that stays under 200 microseconds, even as the queue depth increases. As a point of reference, Intel's P3700 NAND SSD operates at just below 3 milliseconds under the same conditions. VMblog: All of that seems so fast, even the flash. Why is latency so important? Linnell: Remember, the purpose of a host-side cache is to get data closer to the CPU in order to minimize system latencies. Consider Amdahl's law, which says that that in any system where there are two different modes of performance, eventually the slower mode will always dominate the performance of the overall system. The limitation of system performance in this case will be dictated by the ratio of service time of any particular operation from one of the CPU's on-chip caches versus having to serve data from the external cache. Since the internal service times are all measured in nano- or micro- seconds, we can see by this argument that being able to control the cache service times within say 100uS will be far more performant than having to wait in some cases almost 3ms for the data to arrive. VMblog: You mention the stability of response time even as queue depth increases. Is this different from flash? Linnell: Absolutely. One characteristic of flash-based devices that most people are not aware of is that the individual flash chips themselves are really quite slow. The way that you get good performance out of SSD/NVMe cards is that designers provide many parallel channels so that many operations can go on simultaneously; for example, NVMe cards typically have 32 channels. The caveat is that you can only achieve the maximum spec performance when all channels are active. In the real world, however, parallelism can be hard to achieve. In many typical situations there may only exist a few outstanding requests at any given time, so many of these channels will be sitting idle. With Optane you get much higher performance at lower levels of parallelism, so overall the practical difference in performance in the real world is actually much higher than the simple comparison of maximum spec values between the two. The issue regarding parallelism is probably less severe in the typical system environments that we see, because with virtualization we are going to be seeing parallel workload streams from many / several VMs, but in the general case it still means that the Optane will reach peak performance sooner than its rival, and the less expensive we make every off-chip access, the better off the system is as a whole. VMblog: One of the characteristics of flash that systems and array vendors have designed around is the known asymmetry between read (very fast) and write (slow) performance. How does Optane compare? Linnell: Returning to Amdahl's law above, because the ratio of read/write performance in Optane is far lower that that of flash, then it follows that Optane will be far less affected by write performance. Even write-through caches (like ours at Infinio) need frequent updating due to misses and overwrites. The ability of the Optane technology to maintain a tight distribution of access times across varying workloads that are within a couple of orders of magnitude of the on-chip access times is highly desirable for a caching function. VMblog: How do you recommend IT leaders get started with this new technology? Linnell: Look, as with any new technology, starting off with a modest pilot or small project is often the best way to acclimate. In fact, even without Optane, IT architects can download and try Infinio with RAM (and, optionally, flash) to get a sense of the benefits of server-side caching. As a quick plug for Infinio, I'll mention that it installs in just 15 minutes with no downtime or even hosts in maintenance mode. Once deployed, Infinio allows you to experiment with different media, for example, adding Optane to a RAM-only deployment, or changing out flash for Optane in the future.